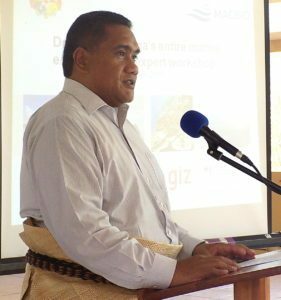 Data and technical input is important to ensure that correct information on Tonga’s oceans and marine environment is available, the Chief Executive Officer for MEIDECC, Mr Paula Ma’u told a workshop on the marine environment in Nuku’alofa on the 19th of April. While opening the ‘National Expert Workshop On The Establishment of Biological regions to describe Tonga’s Marine Environment’ at the Moulton Hall, Mr Mau’s said the workshop was an important one for Tonga, as a signatory to the Convention of Biodiversity (CBD). Mr Ma’u said Tonga’s commitment, along with other Pacific Island Countries and other State Parties, means that the Kingdom needs to manage and protect a proportion of the coastal and marine areas through an effectively managed, ecologically representative and well-connected systems of protected areas and other effective area-based conservation measures, integrated into the wider landscape and seascape. “Tonga is implementing this commitment through an ocean-wide marine spatial planning process,” Mr Ma’u said. He said the vision of the marine spatial planning process is for Tonga’s ocean to be ecologically sustainable social and economic development for the benefit of all Tongans. protect and rehabilitate the environment. 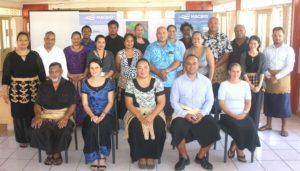 The workshop, organised by MEIDECC in partnership with the Marine and Coastal Biodiversity Management in Pacific Island Countries (MACBIO) project, included participants from government ministries including Fisheries, MEIDECC, Lands and Survey and Tourism. Also attending were representatives from the Civil Society of Tonga, Ports Authority, PUMA, private sector and Non Government Organisations like VEPA Vava’u. Discussions focused on reviewing Tonga’s marine spatial planning process, review status of report on Tonga’s special and unique marine areas (SUMA), a look into the process used to describe Tonga’s marine environment and results, review of the deep-water marine bio-region boundaries and descriptions and the review of the reef-associated bioregion boundaries and descriptions. Lead facilitator Dr Leanne Fernades of the MACBIO project said the workshop was important for Tonga, especially in the sharing of data and information that would help in ensuring there is the availability of correct data and information on the country’s marine environment. Local MACBIO project co-ordinator in Tonga, Ms Eileen Fonua said the workshop hopes to give participants the opportunity to examine the preliminary marine bioregions and consider the accuracy of the preliminary report. 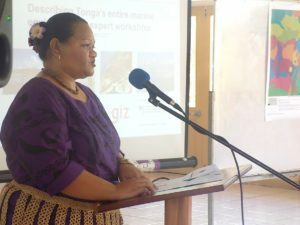 “The resulting proposed marine bioregions for Tonga can be used to inform the national process aiming to identify and select ecologically representative and well connected systems of marine protected areas as well as inform decisions about the location of other types of ocean management areas,” she said.